Embassy Suites Destin is the first upscale all suites hotel of its kind to grace the Emerald Coast and South Walton County beaches, situated directly across from the Gulf of Mexico's pristine, white sandy beaches. 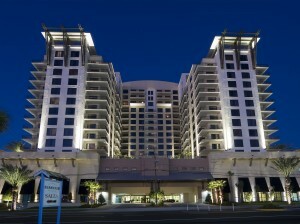 Embassy Suites Destin features 155 two-room suites, several with Gulf views. Fifteen "Celebration Suites" feature Jacuzzi tubs, bathtubs, four poster beds and luxurious amenities. 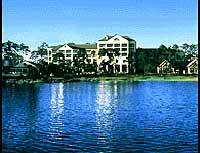 DestinTimeshareResale.com offers a variety of timeshares for sale within upscale resorts like Club Destin Resort, Wyndham Bay Club, and The Bay Club of Sandestin. Destin timeshare units are well-appointed and often include full kitchens, internet access, televisions, and whirlpool tubs. On-site conveniences are plentiful with pools, restaurants, saunas, and tennis courts. 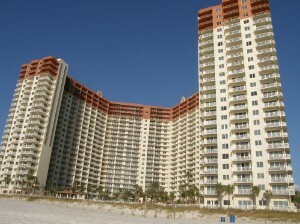 9300 U.S. Hwy 98 W.
We offer a large selection of vacation condo rentals in Panama City Beach Florida. 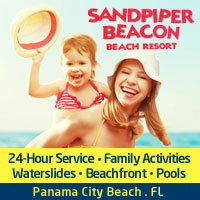 Everything from beach view hotel rooms to beach front condos... you'll be surprised at our rates too! All rooms newly renovated with private balconies & spectacular views of the Gulf. 4 outdoor pools, beach activities including wave runners, jet skis & parasailing on Floridas best beaches. Nightly entertainment with Clutch (50s & 60s style Las Vegas), restaurants & more. A perfect place for your Florida vacation. Approximately 80 feet to the Boardwalk and sandy white beaches. The Beachwalk hotel is considered to be a quaint hotel-style charming, relaxing, and friendly service that has fulfilled the needs of traveler, vacationing or business. Each air-condition guestroom offers sunrise and sunset for the ultimate view on the beach. ADA approved rooms may be available upon request. Each luxurious pool-side rooms are well appointed with colors of the tropics also large picture windows. Amenities include air-conditioned, hair dryer, iron and ironing board, microwave, refrigerator and desks with data-port telephones. Hotel facilities include a secluded palm tree spacious heated swimming pool, kiddy pool, fitness center and two restaurants available. Attractions and restaurants are within walking distance from the hotel. Each luxurious guestroom overlooks the ocean and offers a spectacular view of the beach. Amenities include two double beds with a private balcony, microwave and refrigerator. Hotel facilities include a secluded palm tree, spacious heated swimming pool and meeting rooms available. All rooms have individual climate control, telephone with message light, dataport and voicemail, color TV, AM/FM alarm clock radio, cable movie channels and in-room pay movies. Hotel services include a prompt valet service, Guest laundry service, gift shop, Beauty shop and barber, a caring baby-sitting service, safe deposit boxes, free parking, boutiques, an on-site notary public, bank, post office, travel agency, and marina. If you enjoy recreational sports you'll be more than satisfied with our amenities. 314 Miracle Strip Parkway SW.
1350 US Hwy 98 E.
100 Miracle Strip Pkwy. SW.
13623 W. Front Beach Rd. 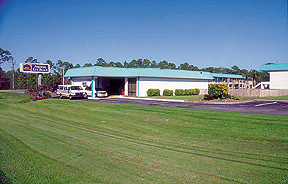 Hwy 98 & Ave. C.
The Howard Johnson Inn at Pensacola Florida is located at Mobile Highway & Fairfield South of I-10. We offer clean, comfortable accommodations for the family or business travelers. Downtown 2 miles, Navy Base 1 mile, Brownsville Church 1 mile from here. 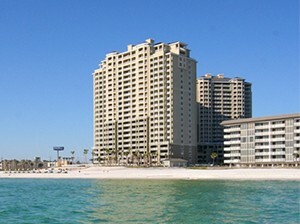 14 Via de Luna Dr.
Paradise awaits you at the Best Western Perdido Key Beach. Imagine warm tropical breezes, endless sugar-white beaches, and the azure waters of the Gulf of Mexico. The Best Western Perdido Key makes your stay easy with a children's playground, outdoor pool, indoor Jacuzzi¨, microwaves, refrigerators, and a free continental breakfast. All at a family priced rate. If you are looking for paradise, plan to stay at the Best Western Perdido Key Beach, where every day is Just Another Day in Paradise.